We don’t have any Moe’s restaurants in our area, but we do occasionally dine at the local Chipotle restaurants. I’m really shocked by the “expose” from 100 Days of Real Food, although I suppose nothing should shock me about our commercial food system. Yea, I understood that Chipotle was fast food, but I always thought it would be a better choice than perhaps McDonalds or even the 99 Restaurant. Yeah, I fell for the marketing. But after reading her article (please go read it, it’s fascinating! ), I’m really saddened. I should have expected it though. It only proves that any large-scale food business is going to be somehow compromised. It’s impossible to feed millions of people and not have to cut corners with GMOs, trans fats, and fillers. Will I continue to eat at Chipotle? Maybe. Probably. But my eyes will be open, and I will rank their restaurant the same as any other fast food or chain restaurant. If I feel like Mexican, okay, but I won’t single them out as being a healthier choice than IHOP or Wendy’s. They’re all the same! Walmart is in full tilt promotion mode. On Master Chef tonight, they were shamelessly promoting Walmart’s new USDA Choice steaks, touting how cheap they were, but not bothering to mention that the cheap meat is raised in a devastating factory farm. Shame on Gordon Ramsey who used to be all about sustainability and high quality food. It just goes to show how a few advertising dollars can sway someone’s ethics. And while we’re at it, someone needs to smack, err, gently wipe the smugness off Joe Bastianich’s face, because who is he to condemn someone’s cooking ability or knowledge, when he has resorted to promoting food that he would never in a million years eat. It’s disgusting! McDonald’s senior director of culinary innovation, “chef” Daniel Coudreaut, was recently interviewed by Lisa Abraham, a Beacon Journal food writer. Besides chef Coudreaut’s crazy statement that he “doesn’t see anything on the menu that’s unhealthy,” he was promoting the “healthy” items on McDonald’s menu. It made me giggle that he’s an actual “chef” – a chef??! at McDonald’s??? Isn’t that an oxymoron? He should be refer to himself as a chemist, because there is nothing chef-like about creating the “food products” at McDonald’s, and there certainly isn’t anything healthy about them either. It’s all about choice, balance and moderation. There are healthful items on the McDonald’s menu — oatmeal, yogurt parfaits, salads, grilled chicken and low-fat milk. Stop right there! These are what he considers the healthful items at McDonalds? Oatmeal, yogurt parfaits, salads, grilled chicken and low-fat milk? Time to dissect each one! Yes! In our nation’s current obesity crisis, oatmeal with 32g of sugar is something to be proud of. I suppose it beats the 42g of fat in a double quarter pounder! Sure, you can order the oatmeal without brown sugar & cranberry raisin mix, but what average McDonald’s patron is going to do that? They see the word oatmeal, and it immediately brings to mind something healthy. And McDonald’s preys on that misconception! In reality, what is the difference between their loaded up oatmeal and any one of the sugar-laden dry cereals like Honey Smacks or Fruit Loops? McDonald’s Yogurt Parfaits are probably one of the sneakiest items on their menu. At least with a Big Mac, you know what you are getting! Just like oatmeal, consumers have considered yogurt synonymous with a healthy food item, but most commercial flavored yogurts are loaded with refined sugar; McDonald’s yogurt parfaits are no exception, with 23g of sugar in their 5.2 oz (149g) serving. Even if you just ate their yogurt “plain”, you’d still be getting 16g of sugar because they’ve added refined sugar PLUS fructose in their ingredients. And it’s only a 3 oz serving. In comparison, a container of low-fat plain Stonyfield yogurt is 6 oz and contains 11g of sugar (natural dairy sugar). That’s 5.5g sugar if you match McDonald’s 3 oz serving. So, if you opt for McDonald’s yogurt, you’re getting 3x the sugar! What is healthy about that??? Next is Salads. Yeah, we all know how misrepresented salads are in restaurants. It’s been repeated over and over in a trillion different ways on TV and in print! But we still don’t listen. Actually, it’s really not the salads that are unhealthy, it’s the dressing slobbering all over the salad that makes it unhealthy. Can you believe that 2 fl oz of Newman’s Own Creamy Caesar dressing (that’s 2 Tbsp) is 190 calories: 18g fat and 500mg sodium. All for a “healthy” salad! You probably thought I could give McDonald’s Grilled Chicken a pass, right? Wrong. Grilled chicken, made at home, can be healthy, if it’s just plain chicken. But add a McDonald’s white flour bun & cheese, slap on some mayo and you’ve got 400 calories with 13g of fat, 840g sodium, and 8g of sugar. Yikes! If you think that eating just their chicken by itself would be a healthy choice, you’d also be wrong. Chicken breast fillet with rib meat, water, seasoning (rice starch, salt, sugar, yeast extract, canola oil, onion powder, maltodextrin, chicken skin, paprika, flavor, sunflower oil, chicken, garlic powder, chicken fat, spices), sodium phosphates. Prepared with Liquid Margarine: Liquid soybean oil and hydrogenated cottonseed and soybean oils, water, partially hydrogenated soybean oil, salt, soy lecithin, mono-and diglycerides, sodium benzoate and potassium sorbate (preservatives), artificial flavor, citric acid, vitamin A palmitate, beta carotene (color). They’ve even sneaked some sugar in the “seasoning” and I just love their “liquid margarine” – GROSS! Okay, I will give the low-fat milk a pass, although I’m not convinced that low fat dairy is all that healthy, but that’s for another discussion. So, I’m not going to lie and state that I never ever go to McDonald’s, but when I go, I’m not fooling myself into thinking I’m eating something healthy. It’s junk food. It’s ALL junk food. From the oatmeal to the fish filet, it’s junk food and it’s time we STOP allowing corporate Food’s CEOs and “chefs” to continue feeding us their misleading marketing myths! Wake up and smell the oatmeal! Just saw a TV commercial for Hamburger Helper. The family is together, sitting at the dinner table and the dad is stuffed so he leans back and pats his belly, full to the brim. He looks at his young daughter, they smile at each other and she imitates him, patting her belly as well. Camera pans out to show everyone is happy and laughing as they all pat their full bellies after dinner. So that’s the message of Big Food! Inspiring families to eat meals together, but eat until bellies are stuffed or better yet, over-stuffed! And THAT, in a nutshell, is what’s wrong with our dysfunctional eating habits. We don’t stop eating BEFORE we get to the point of busting our bellies! Our brains are broken, not connecting with our bellies to tell us to stop eating. The bigger problem is, overly-processed foods like Hamburger Helper are never going to satiate us, so we have to keep eating, and eating, and eating, until it’s too late and our bellies are beyond stuffed. So, good ole Betty Crocker is taking advantage of our dysfunction by feeding us more of their processed crap, that tastes really, really good, but doesn’t do anything to really NOURISH us. Stuffing your belly, until it hurts, with white pasta drowned in dried cheeses is not healthy, even if mom makes it at home, and all family members eat it together at the dinner table! Okay, it’s bad enough that Yoplait has a pink ribbon campaign, but I was shocked to see a Connecticut oil company started promoting “Fuel For the Cure” with a pink oil truck. Hmm, why is it that companies can’t just make a freakin’ donation if they believe in the cause so much? No, they need to drum up sales first, then make a donation. It’s sickening. And more importantly, how do we really know for sure that the oil refineries aren’t ultimately causing breast cancer? Yeah, it looks like it has a hand in causing certain blood cancers, along with damaging our kidneys, liver, nervous system and causing blood pressure and blood clotting issues. And if that’s not enough, it’s poisoning our environment. So, keep up the good work, Standard Oil. And add one more “pink ribbon” fiasco to the Susan G. Komen organization. Maybe someday you’ll actually find a CURE for cancer with all that money that floats your way! Nah, I doubt it. 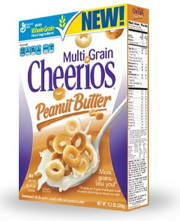 Multi Grain Peanut Butter Cheerios – What’s Next General Mills? Cheerios used to be thought of as one of the “good” cereals, but over the years, General Mills has capitalized on the Cheerios name to produce UN-healthier, alternative flavors like Dulce de Leche Cheerios and Chocolate Cheerios. And now Peanut Butter is part of the Cheerios flavor family! No, 9 grams isn’t earth shattering, but do you know how small a serving of 3/4 cup is? Pretty small. My guess is, most consumers will go for 2 servings, which brings the sugar up to 18 grams. It’s even sadder that regular Cheerios now has ingredients like “modified corn starch” and “wheat starch” – Do you think these highly-processed ingredients were part of the package years ago when Cheerios were first produced? I doubt it. Consumers don’t realize that highly processed grains (like in commercial cereals) do not offer the same qualities and benefits as fresh whole grains. Plus, there’s the issue of GMO corn and soy, along with sugars, unnecessary oils & emulsifiers (monoglycerides), preservatives, and colors. And why all the extra added vitamins? Let’s just keep the vitamins in our fruits and vegetables, and stop the sneaky marketing! And one more BIG strike against General Mills is that this is going to cause a lot of peanut allergy issues due to the similarity to regular cheerios! It’s especially disconcerting since the packaging for both the multi-grain peanut butter and plain multi-grain look very similar. Plus the actual cereal pieces are virtually identical as well. It’s been reported that a parent accidentally brought home a box of the peanut butter cereal and thankfully his wife caught the error before serving it to their allergic child. So What’s Next General Mills? So what’s next General Mills? Will you come out with Birthday Cake flavored Cheerios? How about Bacon flavored Cheerios? Maybe someday, consumers will stop falling for Big Food’s cute clever marketing, but then what would Big Pharma do if the world was free of obesity, cancer, diabetes, high cholesterol, and high blood pressure? 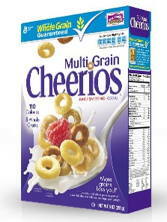 Author debbie @ That's Just MePosted on February 25, 2012 February 24, 2012 Categories Food, ReviewsTags breakfast, cereal, cheerios, chemicals, FOOD, junk food, peanut butter, peanut butter cheerios, Reviews, scam, sugar, unhealthy4 Comments on Multi Grain Peanut Butter Cheerios – What’s Next General Mills? Yesterday, I was reading the online vendor list for a Farmers Market located at a nearby Agway store, and I noticed this week they were also allowing Girl Scout Cookies for sale. Sorry, a Farmers Market is not the place to sell high-sugar junk-food made with partially hydrogenated oils, I don’t care what the organization is! This same market is also allowing multi-level-marketing vendors selling “so-called natural” skin-care products and over-priced cookware. Disgraceful! In the past couple of years, there has been a lot of buzz about Farmers Markets; it’s the current “in” thing to do, with one popping up in virtually every town in my area. Similar to how most local New England country fairs have turned into commercial marketplaces offering slicer-dicers, t-shirts, and crappy jewelery, it’s a shame that some winter Farmers Markets in our area have slowly turned to the same direction. Besides the Agway Farmer’s Market referenced above, I took a closer look at another local garden store’s cleverly named Winter ”Farmers-plus” Market, and was surprised to find a local butcher was participating. No, this butcher does not sell meat from local farms, or even antibiotic/hormone-free meat. Will consumers realize that? Or will they quickly make assumptions about the quality of their meat based primarily on the fact that this business was allowed to participate? Allowing vendors like this cheapens the idea behind Farmers Markets and takes advantage of the public’s trust. Just as the food marketing labels “natural” and “free range” have been abused beyond recognition, I am hoping our beloved farmers markets are not heading down a similar path. Yes, I understand that market organizers need to cover their costs, and could feel pressure to minimize their standards during the winter because there are not many New England farms that offer winter produce. Thankfully, there are still a few independent New England winter markets in the area that successfully retain their high standards throughout the year without compromise! What can consumers do to protect themselves against irresponsible Farmers Market organizations? First and foremost, you must check the integrity of the farmers market. Do they have a mission statement? And if so, do they have specific standards that each participating vendor must adhere to before they are accepted? Do not be afraid to ask questions. Get to know the vendors at the markets. Ask them specifically about their products and do not feel pressured to purchase from them if they do not meet your standards. 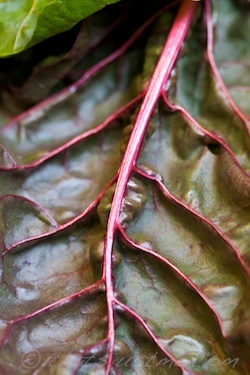 Do not assume that just because they are a vendor at a Farmer’s Market that they offer a sustainable, quality product. We watched the CBS This Morning show and they showcased the “best new consumer products” from Better Homes & Gardens. 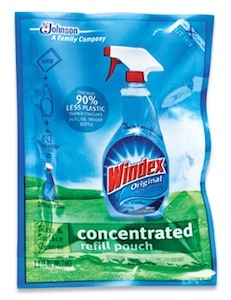 I had to laugh because one of their recommendations was the Windex Mini Concentrated Refill Pouch – they touted it as better for the environment because there was less waste in the packaging. Huh? Okay, saving the environment with smaller packaging, but perhaps ruining our lungs, soil, and water supply with toxic chemicals inside the smaller package. That makes no sense! Wouldn’t it be refreshing if Better Homes and Gardens really did try to make our homes and gardens better by recommending natural products that weren’t poisoning our lungs and environment; but I guess their big corporate advertisers like Johnson & Johnson wouldn’t like that too much, would they? Yeah, Johnson & Johnson claim to be transparent with their list of ingredients; they really try hard to convince us that there is no danger with the chemicals they use, but truthfully, ammonia is toxic for our lungs, skin and our earth no matter how hard they try to spin it otherwise. There is also absolutely no need for “fragrance” but unfortunately the public equates clean with a strong chemical smell. It’s really very troubling. The worst part is because the product is ultra concentrated, these ingredients are super strong compared to regular bottled windex. I can’t even imagine this product being accidentally ingested by children or pets, or spilled on your skin or down the drain. Take a peek at Windex’s Material Safety Data Sheet (MSDS) (link opens to a pdf file) and it should scare the crap out of you! Please keep products like Windex out of your home! Try a mixture of plain white vinegar and water in a spray bottle; it’s 100% non-toxic! I use vinegar & water to clean my counters, sink, and even my produce. It works great! As predicted, Paula Deen made the official announcement that she is diabetic. Even though she was diagnosed 3 years ago, her reason for coming forward now is that she wants to help others. The site is financed by Novo Nordisk, a Diabetes DRUG company, so right there, that’s a HUGE conflict of interest. There is nothing on the site that mentions PREVENTION of diabetes, only what to do if you’ve already diagnosed. Hmm, why prevent diabetes when there is so much money to be made. Victoza’s list of scary cautions & warnings on every page should be enough to make anyone think twice about taking this drug. Basically all the web site accomplishes is regurgitating common-sense diabetes advice while tricking you into giving them your personal information in order to sign up for a newsletter. Why do they need your mailing address for an email newsletter? hmm….the answer is at the bottom of the form, Novo Nordisk want your permission to bombard you with marketing materials from them and their “affiliates or vendors.” What do you get in return? Oh some delicious, diabetic-friendly recipes. Worth it, right? If Paula Deen truly cared about people then she would be giving her re-worked recipes and tips for free, without making you sign away your privacy to a drug company! I watched the Paula Deen interview on the Today show, and she tried so hard to convince us that all she wants to do is help people, but at the same time she skirts around the question if she’ll change the way she cooks and eats. Her eventual answer was that she NEVER ate like that every day, it’s just entertainment, ya’all, and that she’s always been about moderation. Since when, Paula? Perhaps she should have mentioned more about moderation during her “butter is beautiful” or “add another cup o’ sugar” shows on Food Network. Ugh. Yeah, what a great role model. It’s just for entertainment! Wouldn’t it have been refreshing if Paula came forward and admitted that she was wrong, and that she made a lot of big mistakes with her health? There’s no money in mistakes. Don’t change your life, just take some meds. This situation angers me the most because she didn’t go public with her illness until she secured a lucrative deal, and since the local farm-fresh industry is not paying for endorsements, why promote a change in lifestyle for free, when a top-bidding Big Pharma company will pay you millions to promote their drugs! And the topper is Novo Nordisk is actually claiming that when they came to her to be a partner, they didn’t know she was diagnosed with diabetes. wink wink. Yeah, the National Enquirer knew, but no one else did? Makes me sick. I think I’ll eat some butter. Cheap Food (Turkey) Is NOT the Answer! The holiday season is upon us, and everyone is scrambling to find the best deal on cheap turkeys, stuffing, potatoes and gravy for their holiday meal(s). Grocery stores are promoting their sales, and home cooks are rejoicing! But in what kind of world does it make sense that a turkey can be raised and sold for only .40 to .50 per pound??? That is scary when you really, truly think about it. Americans are brainwashed to expect cheap products, but we need to reprogram our minds to reject food raised in “factory-farmed” conditions. Cheap meat (including poultry, eggs and dairy) is a direct result of factory farming, which abuses animals and is destroying our environment. And it’s not just animal products, cheap produce is causing poor soil quality, which then demands toxic fertilizers and pesticides; this affects the health of farm workers, as well as the health of those consuming the produce. It’s unfortunate, but we’ve become a nation that is dictated by the thrill of a “bargain.” I’m not saying that we shouldn’t strive to save money when grocery shopping, but we shouldn’t expect unreasonably rock-bottom prices either. There’s a reason that it’s so cheap, and we’re paying the price with our health and our environment. There can be a middle ground. Consuming less animal products and more plant-based products will allow you to buy better quality food. Do we not love ourselves enough to give our bodies the best we can when it comes to food? We can change the world when we vote with our forks! I suppose it’s easy for me to get on a soapbox and spew advice; I don’t have a large family to feed (there’s just two of us) so I consider myself lucky that I am able to make a choice to purchase better quality food. My little family is not “well-off” – we’re middle-class, actually lower-middle-class. I worry about what will happen when we “retire” in a few years; how will we survive with the money we’ve saved? Medical costs are exploding sky high; I see that as a direct correlation to the cost of cheap food, so I intend to try to keep our bodies healthy! I’m hoping that spending more on good quality food will pay off in our older years with a fuller active life without obesity, cancer, diabetes, and chronic pain. Author debbie @ That's Just MePosted on November 18, 2011 November 25, 2011 Categories FoodTags 52 Foods in 52, factory farm, FOOD, healthy, sustainability, Thanksgiving, turkey, unhealthy, vegetables2 Comments on Cheap Food (Turkey) Is NOT the Answer!